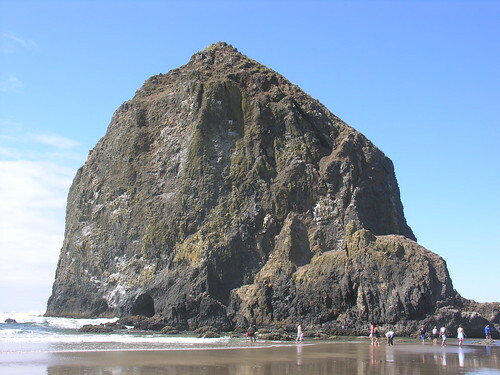 Since Haystack Rock is protected, people are not supposed to climb on it. However, creatures – both human and animal – find it very hard to stay away. On a several-mile stretch of beach at any given time, most of those on the beach are near or heading toward Haystack Rock. 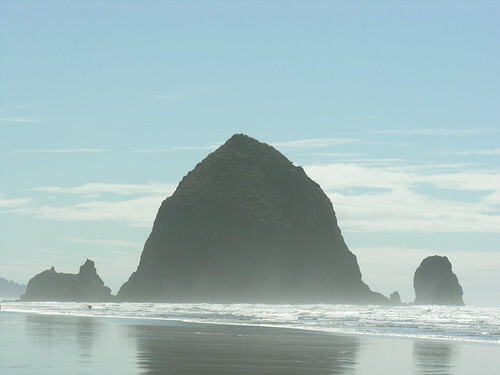 One of the ten largest monoliths in the world, Haystack Rock forms the beach centerpiece for Cannon Beach. At 235 feet tall, human beings become dwarfed easily by Haystack Rock’s immense, but graceful, massiveness. Formed from volcanic activity millions of years ago, the monolith was created from lava flows, which resulted in its basalt composition. 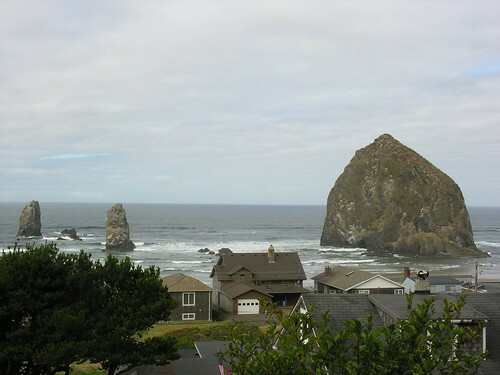 In a location where summer cottages are built in tiers to overlook the ocean, a view of Haystack Rock is even more prestigious – and costly. The coastline of Oregon is extremely photogenic, but Haystack Rock is one of the most photographed. This entry was posted on Monday, September 21st, 2009 at 6:00 am	and is filed under Beach, Mountains, Romantic Locations, Scenery, Travel. You can follow any responses to this entry through the RSS 2.0 feed. You can leave a response, or trackback from your own site.